One of the most important schedule management indicators is the amount of time it takes to complete the cards of a board. 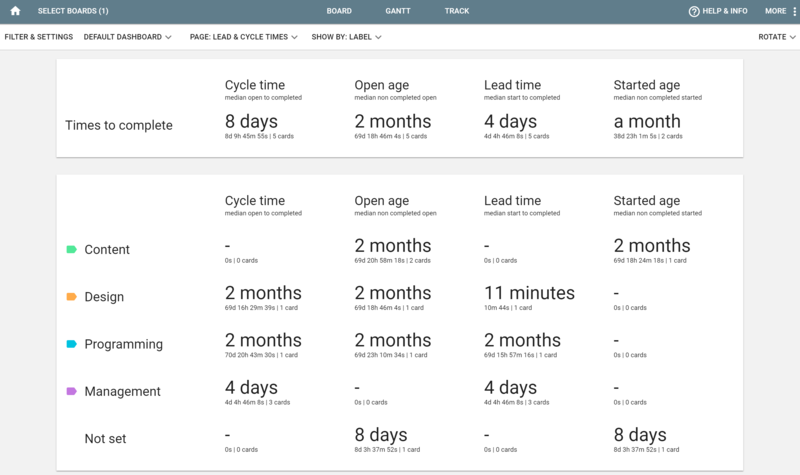 This information can be found in the Lead & Cycle Times page, available in the Default Dashboard. Cycle time - the median of the time it takes for the tasks of the project to go from open status to completed status. Open age - the median of the time that the cards that are not completed are in your board. This will be calculated based on the non-completed tasks - the completed tasks will be out of this equation. Lead time - the median of the time it takes for the tasks of the project to go from started status to completed status. So the lead time counter starts when an open card is set to started, until it is completed. Started age - the median of the time that the cards that are not completed but have already started are in your board. This will be calculated based on the non-completed and started - the completed tasks and the open tasks (i.e., not started) will be out of this equation. By default, the new card you add to your board will have the status set to open. However, you may also set new cards to "no scope" status, so they won't count in the cycle time median. You can also view specific groups of cards. In the previous example, the 'Show by: label' option was enabled. With this information, you will be able to identify whether the pace of the completion is according to the expectations, and make decisions based on this insight, such as including new members to complete cards faster.